In the first of a series of 2015’s top 10 security products, we present the top 10 video surveillance camera models from 2015, based on click rate from asmag.com. The product must have been uploaded to the asmag.com database between Dec. 2014 and Dec. 2015. The main purpose of the camera must be for professional security; no Wi-Fi cameras, cube cameras, DIY, or cameras targeted at the smart home sector were included. Only one camera per company was chosen. Viewing distribution charts are provided for each product to show from what regions each product is being viewed. Regions included in the chart are as follows: Asia, Americas, Europe, Oceania, and other. Looking back on 2015, while new security innovations may have been limited, there was no shortage of great new products with technological updates. Cameras definitely got a little bit smarter, clearer, and faster, as 4K technology and H.265 compression made its way into the product lineups of companies around the world. While our data definitely shows that HD cameras, even Full HD and Ultra HD, have entered a period of increased adoption, it also shows interest in fisheye cameras has too gone up. 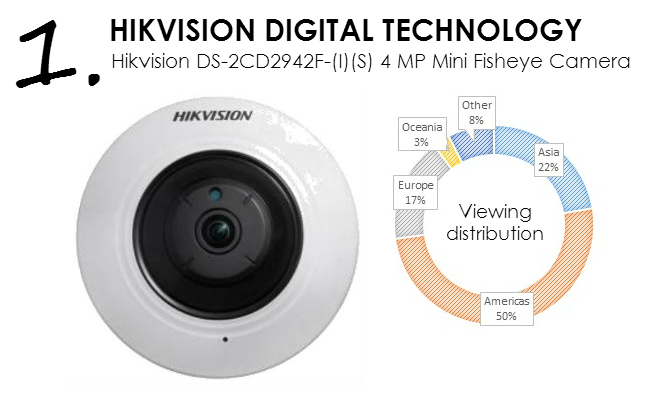 In fact, 3 out of our top 5 cameras in 2015 were fisheye cameras, coming from major video surveillance players Hikvision Digital Technology, VIVOTEK, and Dahua Technology, respectively. The interest in fisheye cameras makes sense, as software for the dewarping of fisheye images has continued to improve. Furthermore, with security budgets around the world tightening, the advantage of a fisheye camera and its wider-scene view could help reduce the number of cameras needed, thereby decreasing the amount needing to be spent on camera equipment. For more information on any of the top 10 products, click on the images below! Check back next week for the top 10 access control software, readers, and controllers of 2015! The Hikvision DS-2CD2942F-(I)(S) was 2015 most looked at video surveillance camera. Featuring a 1/3-inch progressive scan CMOS sensor and up to 4-megapixel resolution, this compact mini fisheye camera offers both fisheye and PTZ views. The camera also features an IR range of approximately 8 meters and 128 G of onboard storage, as well as built-in support for Wi-Fi and one-touch WPS setup. 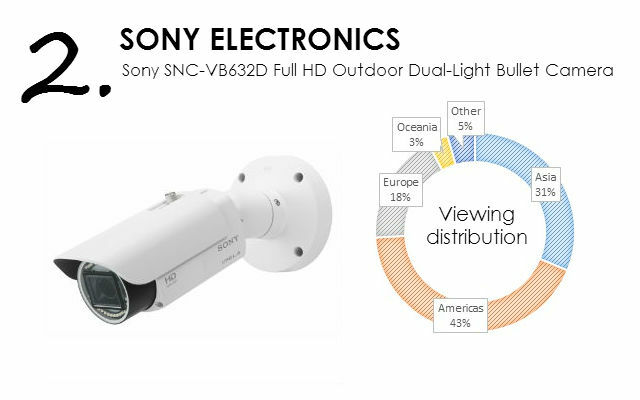 The Sony SNC-VB632D is a Full HD dual-light bullet camera powered by the Ipela Engine EX. The camera has a maximum resolution of 1,920 x 1,080 with the Exmor CMOS sensor and high frame rate of 60 fps. View-DR technology allows the camera to achieve a dynamic range equivalent of 90 dB. Furthermore, the camera is capable of a minimum illumination of 0 lux in black/white mode with the IR illuminator on, and 0.1 lux in color mode at 50 IRE. 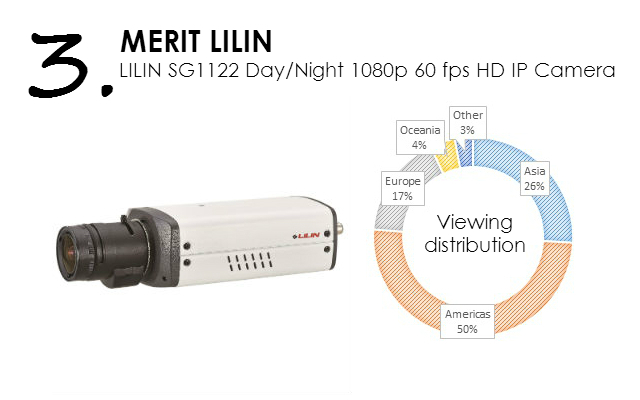 Designed for a variety of indoor applications, the LILIN SG1122, part of the S Series of cameras, has a fast frame rate of 60 fps at 2-megapixel 1080p resolution for crystal clear images. The camera has a progressive scan MOS sensor with 0.01 lux at F1.2 low-light mode capability and is able to capture fast-moving objects during daytime and nighttime. The S Series cameras support high performance H.264 and motion JPEG compression technology. 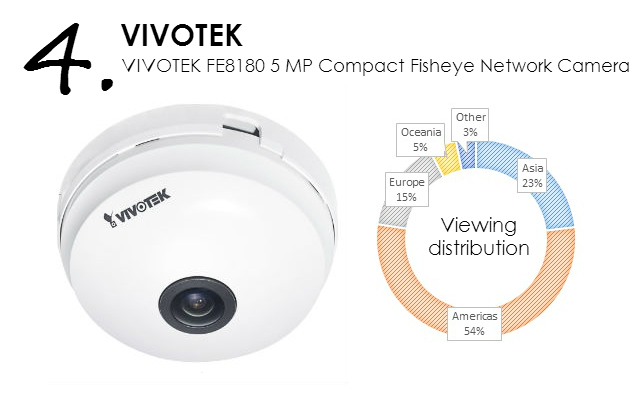 The VIVOTEK FE8180 features a 5-megapixel resolution sensor and a diameter of only 90 mm, meeting a wide variety of needs for indoor surveillance. It is equipped with a fisheye lens for 180-degree panoramic view (wall mount) or 360-degree surround view without blind spots (ceiling mount). The camera is able to provide full video coverage of wide, open areas, such as airport lobbies, shopping malls, retail stores, offices, and more. In addition, in both the panoramic and regional viewing modes, users can utilize the ePTZ function to easily zoom in and focus on a region of interest (ROI). 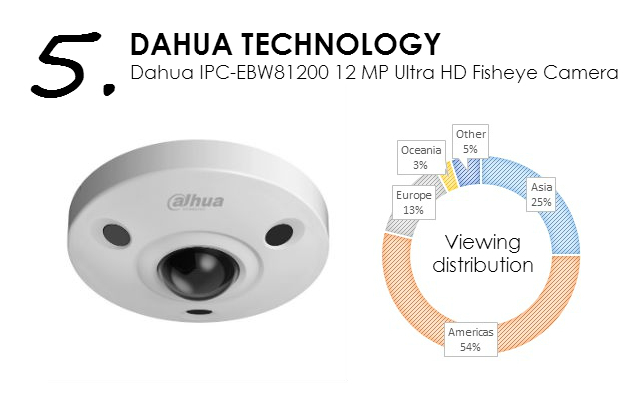 With 12-megapixel resolution, the Dahua IPC-EBW81200 is the highest-resolution camera on our top 10. Featuring a 1/2.3-inch 12-megapixel progressive scan CMOS sensor, the camera is able to capture a max. 15 fps at 12 megapixels (4,000 x 3,000) or 25/30 fps at 3 megapixels (2,048 x 1,536). Other features include H.264 and MJPEG dual-stream encoding, DWDR, day/night ICR, 3DNR, ROI, a max. IR LED length of 10 meters, etc. The camera is also IP67 and IK10 rated and has built-in micro SD memory slot. 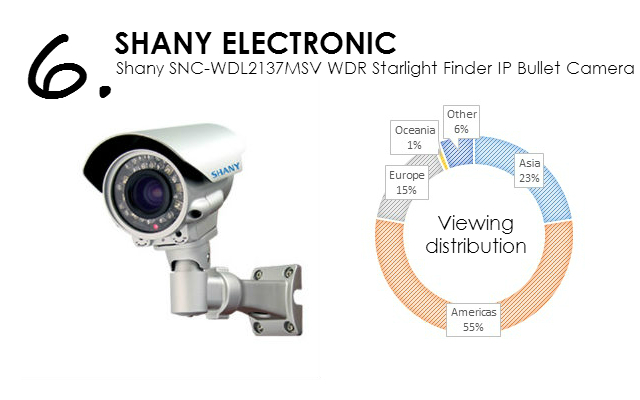 The Shany SNC-WDL2137MSV features a 1/3-inch Sony 1.3-megapixel progressive Exmor CMOS sensor and a video frame rate of up to 30 fps for all video. The camera can meet minimum illumination requirements of 0.03 lux at F1.2 in color and 0.001 lux at F1.2 in black and white; 0 lux can be met at F1.2 with IR on. Other features include 2D/3D noise reduction, motion detection, and PoE power input among others. Support for H.264, MPEG4, and MJPEG compression technologies is also included. 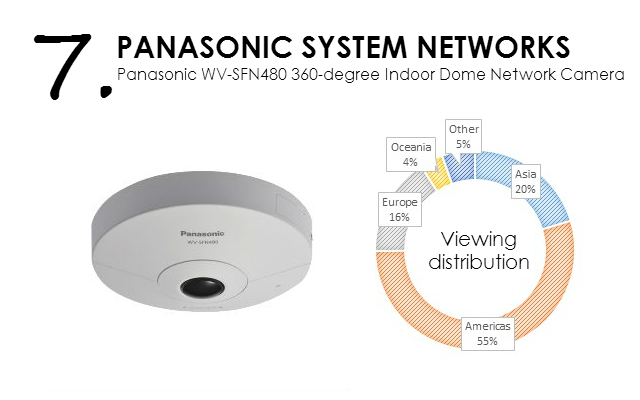 Panasonic’s WV-SFN480 indoor dome network camera features a 4K Ultra HD engine that delivers high-resolution recordings with 9-megapixel images up to 15 fps. Multiple H.264 and JPEG streams allow for real-time monitoring. The camera offers 360-degree monitoring in several different transmission modes: panorama, double panorama, quad PTZ, single PTZ, and quad stream. Its high sensitivity day/night function allows for 0.3 lux (color) and 0.2 lux (black and white) at F1.9. Additionally, the camera can be controlled directly via smartphone using the Panasonic Security View app. As part of the MegaView 2 Series of multi-megapixel cameras, the AV1225PMIR-S provides ample resolution to zoom-in for details in live or recorded video. 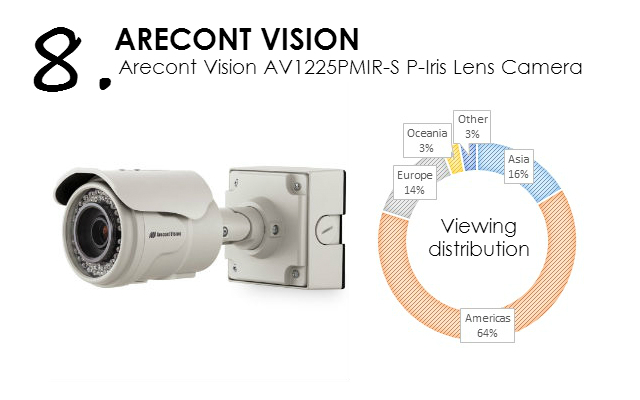 The camera is an indoor/outdoor all-in-one solutions that integrate a 1.2-, 1080p, 3-, 5-, or 10-megapixel camera with fast frame rates and an IR-corrected motorized wide angle or telephoto, P-iris lens into an IP66 environmental rated, tamper-resistant bullet-style housing. It supports H.264 compression to reduce bandwidth and storage requirements while delivering full frame rates and full resolution without sacrificing image quality. 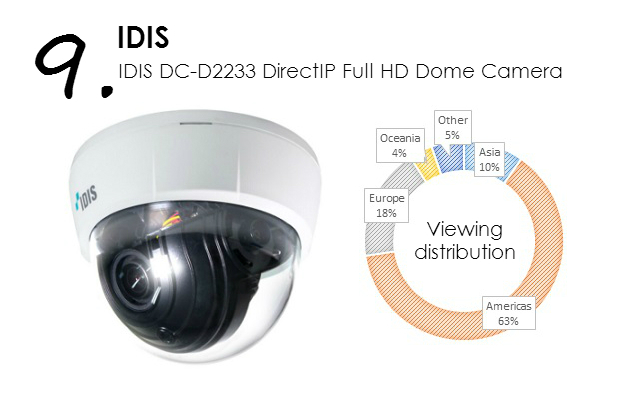 The IDIS DC-D2233 is a Full HD dome camera with a motorized varifocal lens and 1/2.8-inch CMOS senor. The camera is easily installed with the DirectIP NVR. The camera can meet minimum illumination of 0.3 lux at F1.3 in color and 0.002 lux at F1.3 in black and white. It’s IR-cut filter with auto switch makes it a good day/night camera. 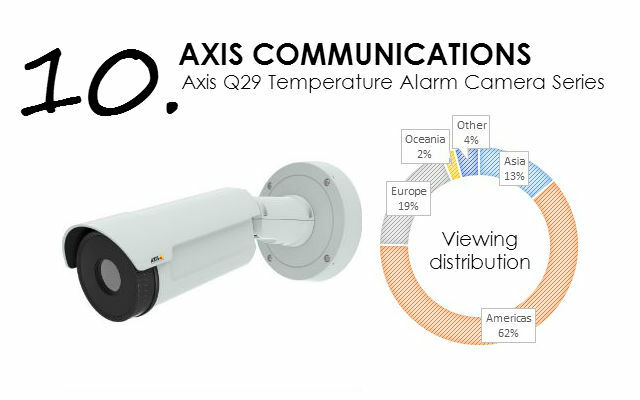 Axis temperature alarm cameras can be used for remote temperature monitoring with the possibility to set temperature alarms. They are ideal for remote monitoring of power generating facilities, fire hazard areas, or industrial processes involving self-igniting materials. It detects the temperature of an object between -40 °C to 550 °C (-40 °F to 1022 °F). When mounted, it is possible to set up multiple alarm zones, which send an alarm when the temperature reaches above or below a pre-configured threshold.